In the Cutts Patented Method of boatbuilding, a double planked skin is laid over a simple set of molds. 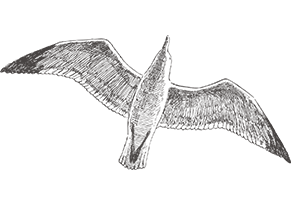 Unlike the usual double planking procedure, the entire inner layer, which is slightly thicker than the outer, is planked up with the edges glued and the garboard glued over an inner keel or keelson plank. After this a veining groove is cut with a routing tool athwartships continuing from sheer to sheer right across the inner keel. 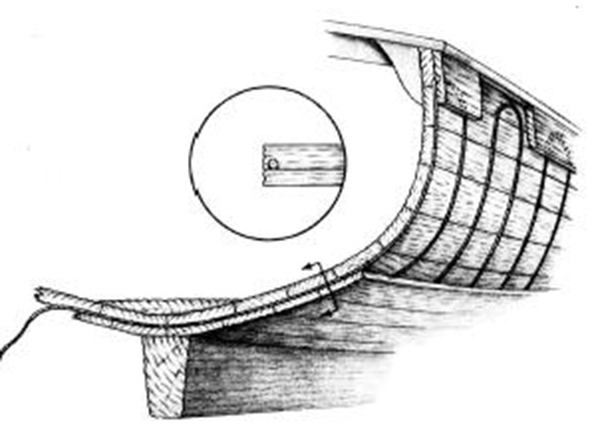 Again, according to the design and several inches apart from the first groove, a second groove is cut and a third and so on for the full length of the boat as shown in the drawing below. An apoxy mix is laid in the grooves and a glue saturated specifically manufactured and treated kevlar cable is slipped into the groove. The cable slips easily into place and any glue that is displaced by the inserted kevlar cable is simply squeegeed back over the cord leaving everything clean and finished. The glue is stronger than the wood. Where the groove meets the stem rabbet, if a rabbet is used at all, a hole is drilled through the back-rabbet at the groove intersect and the epoxy saturated cord is sewn through the hole continuing back in the routed grooveon the other side. After the cords are set as described above, the second layer of planking is glued over the first. While the glue sets, the outer planks are held in place with staging nails or drywall screws driven right into the molds as with the first layer. These nails, or drywall screws are extracted as the glue sets as the second layer proceeds. Because there is only a single gluing, the time required to work with the glue is drastically reduced and the cleanup is minimal. Epoxy costs are reduced considerably.